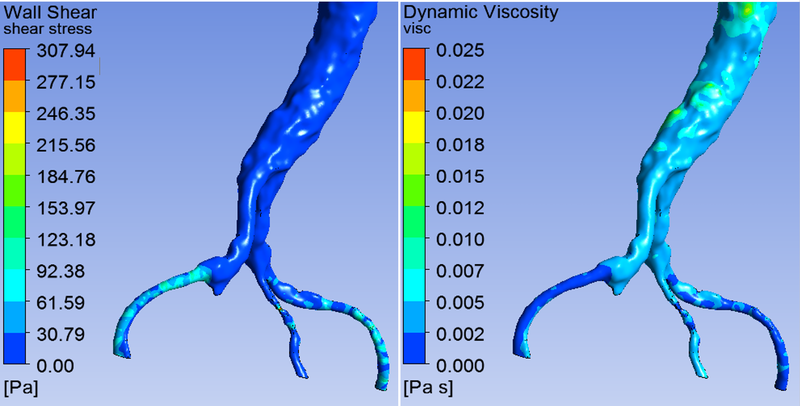 Following on from our recent post on how to handle scanned biomedical data ("How to Shrink Wrap a biomedical STL File"), let's consider another complexity that we typically encounter in CFD of biomedical applications: non-Newtonian viscosity of fluids such as blood. In CFD, we commonly run simulations using fluids that are modelled as Newtonian, which are defined as having a linear relationship between viscous shear stress and shear strain. A result of this linear relationship is that the viscosity of Newtonian fluids is invariant. However, many fluids we encounter in industry do not strain linearly with respect to viscous shear and are thus considered non-Newtonian. In some cases, a non-Newtonian fluid may be assumed to behave in a Newtonian manner, just as it is often acceptable to model air or other gas as incompressible within certain conditions. However, just as there are many scenarios in which a gas must be modelled with an ideal- or real-gas relationship (instead of incompressible) to produce useful CFD results, there are also many situations which necessitate the accurate capture of shear-dependent variations in viscosity. 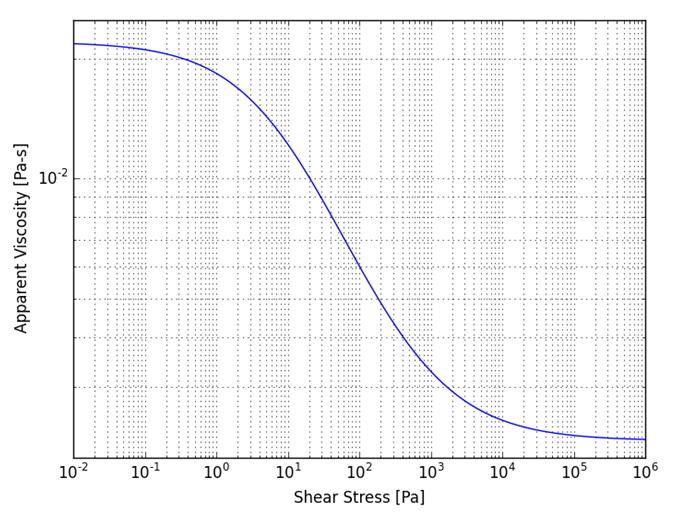 where µ0 is the zero-shear viscosity, µ∞ is the infinite-shear viscosity, and is the shear strain rate. All other variables, as well as µ0 and µ∞, are experimental fit parameters. Figure 1. Viscosity behaviour of a fluid using the Carreau-Yasuda model. Looking at the graph, clearly there are regimes in which a Newtonian approximation could be sufficient. It should be just as clear however, that some regimes require capturing the non-Newtonian behaviour in order to achieve any sort of sensible CFD result and capture all important flow behaviour. In CFX, the Carreau-Yasuda model is built in, meaning you can simply apply the coefficients directly. In Fluent, we can apply the same model via UDF using the DEFINE_PROPERTY macro. The UDF written for this is available here. In summary, we have learnt that applying a non-Newtonian model to the fluid you are simulating is straightforward in ANSYS CFD (either CFX or FLUENT) and this can be an important step to improving the relevance and usefulness of your CFD simulation results in some fields. So the next time your CFD model includes blood, gels, foodstuffs, oils, or any other non-Newtonian fluid, don’t forget that an appropriate material model is just a few mouse-clicks away!